Every year brings new and continuing SEO trends. 2018 is no different. The use of voice searches on mobile devices is still on the rise. Supplementing mobile voice search is the battle between 2 voice controlled speakers: Google Home and Amazon Echo. Smart gadgets are clearly on an upward trend, so optimizing your website with mobile devices in mind is crucial. According to Google, 20% of mobile search queries are from voice searches. This figure is forecasted to increase as the market for smart gadgets with AI capabilities (Siri, Google Assistant, Alexa, etc.) continues to grow in popularity. Businesses should optimize their keywords to account for voice searches. Typically, these queries are in the form of a question or have geographical significance. For example, a query could be “show me restaurants near me” or “what are Target’s store hours”. Focusing on conversational syntax and long-tail keywords will be important for 2018, bringing us to the next trend. 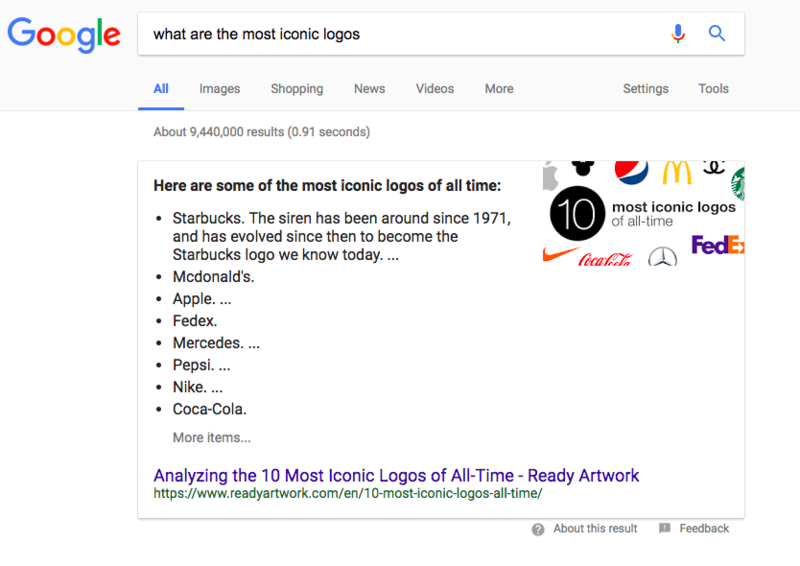 Google often reads results to a voice search with websites that have a featured snippet. A featured snippet is a summarized answer to a query that is placed in a box at the top of the search page. Because this result takes precedence over other links on the search page, being in “position zero” is ideal and well sought after. The example above shows a query that Ready Artwork ranks for that drives a considerable amount of traffic to our website. What does this mean for your small business? Well, content is still king. Having structured content that’s broken down into sections offers more chances to answer search queries. Something like an FAQ page is helpful. Alternatively, appearing in Google’s local pack is also important for small businesses as voice searches are leaning towards local websites. 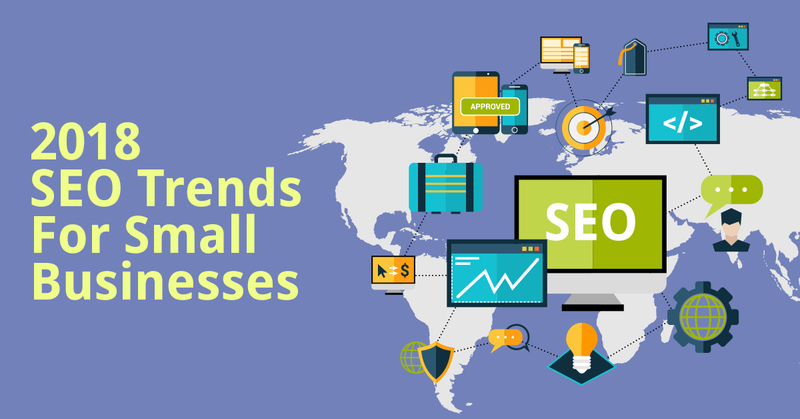 Probably the most important trend small businesses can capitalize on is local SEO. Luckily, Google has been showing local results for broad queries with large volumes, which spells good news for your business. Therefore, having a Google My Business profile is essential for local SEO as it enables you to appear in these results. Another on-page optimization strategy (keeping voice searches in mind) is having your store hours, directions, and a phone number listed on your website. Off-site optimization is also something you should be looking at. Local listings from Yelp, Facebook Local, etc., will help your local ranking on Google. Good customer reviews and ratings from these websites play a factor too. Linkless mentions (people who mention your brand but don’t link to your website) are now considered trust signals. Bing implemented this years ago while Google sneakily included it in a patent listing. Google’s Gary Illyes affirmed that all mentions of your brand on the internet, linked or unlinked, are taken into account, provided that they are reputable, of course. This is where reviews from local listings and social media come into play. Search engine algorithm updates come as often as McDonald’s menu changes. To no one’s surprise, new SEO trends emerged with the new year. Although there are no current algorithm changes specific to voice search, it’s still important to optimize for it, especially as a small business. More and more people are using this function to find information about local businesses. Adjusting to voice search will help your website rank higher on search engines. Does your business need Search Engine Optimization for 2018? Contact our team of specialists to skyrocket your business!